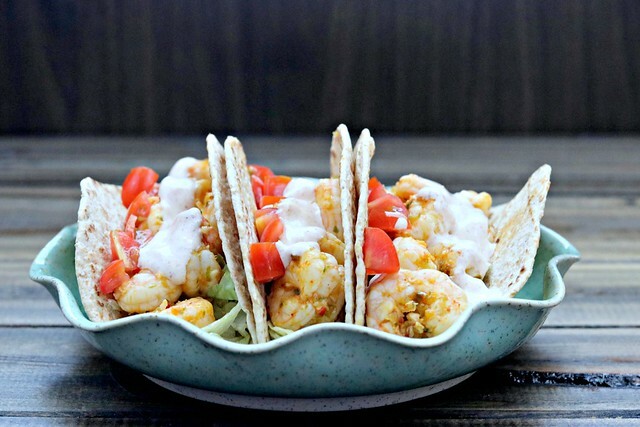 Spicy Shrimp Tacos with Southwest Cream Sauce have the perfect amount of heat with a hint of citrus, topped off with a creamy southwest sauce. I first discovered these shrimp tacos about seven years ago, and while my first go at them became a hybrid of two different versions, I eventually came back around to try the original. And good-ness, were they yummy! I mean…just about anything spicy is right up my alley, and I love me some shrimp so the combo of that plus a southwest flavored sauce?!?! Yep. I’m all over that. Now, if I could just get J on the shrimp-lover wagon, we’d be golden. So far, no such luck. Now and then I’ll get a, “Now that’s a good way to eat shrimp” but overall, he’s just not a fan. And I’ve only made it 24,969,880,987 ways to try and convert him. Do I just throw in the towel and stop trying? But then when will I get to eat it??? I think the key here is to make sure Nat loves it…then it’s not just me who wants it. Yep, I think that’s the way to go. One of the great things about these tacos – besides being insanely delicious – is that you could literally have them on the table in about 15 minutes. Marinate for 10, broil for less than 5, throw them together and stuff your face! It doesn’t get much easier than that, my friends. And, oh, oh, oh! my baby is 13 months old today. Hold me. And bring me these shrimp tacos. Kthanks. In the bowl of a food processor, combine all the ingredients for the marinade, through the salt and pepper, and process until smooth and well combined. Pour over shrimp in a medium bowl, cover, and refrigerate for at least 10 minutes, but no longer than 30. Remove shrimp from marinade and spread onto the baking sheet in a single layer and cook 2-4 minutes, until opaque and cooked through. To assemble: heat tortillas and top with shredded lettuce, shrimp, chopped tomato and southwest cream sauce. Serve with lime wedges, if desired. Girl! I know I ate more than I should have. Seriously. lol.